D'Addario's brightest and most magnetic bass strings. Get the most out of your bass! ProSteels are made from a specialized stainless steel alloy that delivers harmonically rich, brilliant high-end and deep, focused bottom. These strings excel at delivering the ringing piano-like tone that many bass players crave. 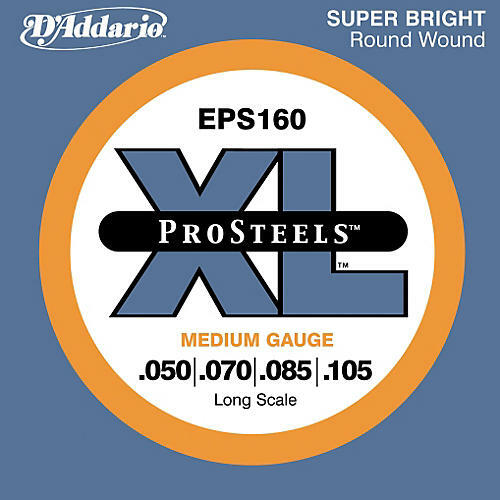 Each wrap is precisely wound onto a hex core using D'Addario's exclusive computer-controlled machines, which monitor and control wrap speed and tension with extreme precision. The result is a set of strings with precise intonation and unparalleled consistency gig after gig. Powerful stainless steel tone to drive your pickups and deliver a powerful, pure, and punchy bass signal. Order today.